Indian walnut Latin name Anacardium occidentale is an evergreen tree of smaller dimensions (it reaches up to 12m in height) that does not originate from India, as many think, but from South America, more precisely from the northeastern part of Brazil. In India, it was transferred by the Portuguese, and today you can find it in this country who is one of the world's largest producers. The Indian nut is a very healthy snack available in almost every well-equipped supermarket and it certainly needs to replace industrial chips and saliva, and to respond to unhealthy eating habits. In many tropical regions (Kenya, Tanzania), Indian walnut is cultivated for its seed and fruit. Its fruit is called cashew and is very popular in native Brazil as well as in some Caribbean islands where it is considered a delicacy. Cashew apples are pear-shaped in length, 7 to 15 cm in length, and have a red or yellow shell covering the juicy pulp, which makes it tasty and rich in vitamin C. In Europe it is more famous for seeds than this fruits - a popular Indian walnut that is in addition to its aromatic taste very useful for our health. This fruit almost looks like a small boxer glove and is about 3 cm in size. It is available and easy to procure throughout the year. 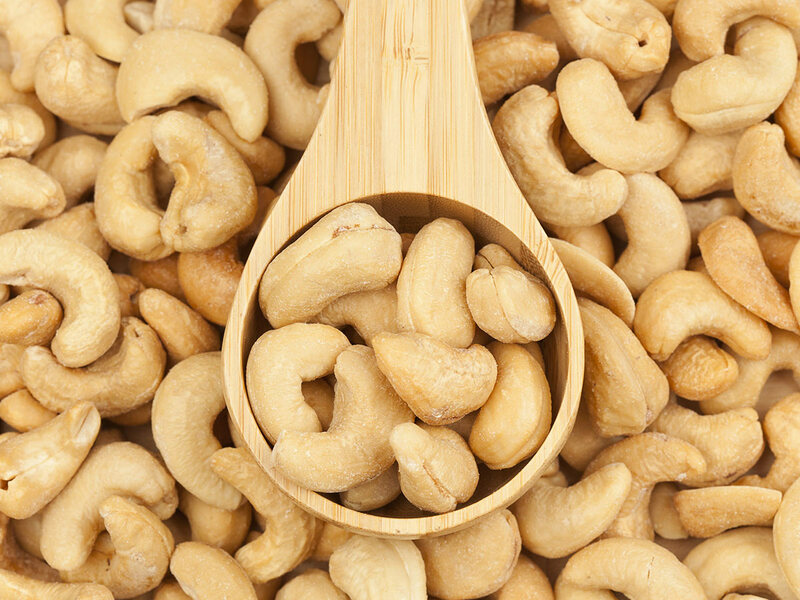 Indian nut is full of essential minerals such as calcium, magnesium, iron, potassium, zinc, phosphorus. It also contains sodium in small quantities. It is extremely nutritious and rich in proteins. In addition to vitamin C, which we have already said is almost five times higher than in orange, Indian nuts are rich in riboflavin (vitamin B2), thiamine (B1), niacin (B3), vitamin B6 as well as folic acid. It contains vitamins K and E, and it is a great source of oleic acid, that provides out our body with excellent amounts of monounsaturated fat, while polynucleicides can be found in small amounts, which are very harmful because they accumulate bad cholesterol. Indian nut is an excellent choice for our health if consumed in the right way, because precisely by correct dosing we regulate good and bad cholesterol in the blood, and it helps in the prevention of heart disease, atherosclerosis and other cardiovascular problems. From the table we conclude that Indian walnut is caloric, so do not overdo it in its consumption if you take care of your weight and plan a diet. Dose it and consume it moderately, do not overdo it. If you are physically active every day, ride a bike, you go regularly in walks you do not need to worry too much, but again, we say moderation is the most important thing. What you're most likely to notice in the table is that the Indian nut contains high amounts of magnesium in just 100 grams. This is very important to us because magnesium plays an important role in our metabolism, especially for bones, muscles, blood clotting and other. By regular intake of magnesium, we will protect the body from complications such as high blood pressure, headaches, chronic tiredness and cramps in the legs and muscles. We believe that in the current part of the text you learned that the Indian nut is much more than a delicious food and that it brings exceptional benefits to our overall health and that we certainly need to have it in the everyday menu. All of us who are trying to resist this humorous, hustle-based way of life in particular know the role of the correct diet for our general psychophysical condition. Instant, fast and unhealthy food, especially chips, hot dogs, fried foods, artificial juices full of additives is something we need to forget as soon as possible, devote ourselves to our health in the right way. Believe it or not, the Indian nuts will help us in all this more than we expect from it. As it contains a lot of fat, those healthy, unsaturated ones, Indian walnuts are an excellent choice for the prevention of cardiovascular diseases. The highest merit is attributed to oleic acid (up to 75 percent) the mentioned unspecified fats. It is also largely in olive oil, which is also recommended for heart patients. The same acid is excellent for the prevention of diabetes, and is certainly recommended for diabetics. It helps lower triglycerides in the blood and in this way protects us from complications that can lead to high levels of sugar and cholesterol. Indian nuts reduce the risk of diabetes type 2. In the human body antioxidants play an important role for health because we are protected from the harmful effects of free radicals. Indian nut certainly is an excellent source of beneficial antioxidants and therefore provides us with protection against diseases of the blood vessels, cancer, diseases of the joints, protects us from the appearance of cataracts, and other health problems that are all the more present. The table of the most powerful natural antioxidants you have in one of our earlier articles goji berries, which we also recommend you read. If Indian walnut is regularly consumed, it reduces the possibility of gallstones formation. This is not a speculation but the result of extensive research, which has been conducted on 80,000 women. Their task was to daily eat Indian walnuts other nuts. We recommend that you read the text about gallstones and their natural treatment. Gingivitis, periodontitis, gums inflammation are just some of the diseases of the mouth that increasingly afflict modern man, precisely because of the consumption of unhealthy industrial food. Indian walnut preserves the health of the gums and teeth, as it successfully destroys bacteria in the mouth that are most responsible for the development before mentioned problems and successfully protects us against the formation of caries. It also has a preventive effect on upper respiratory tract infections, prevents coughing and colds. Many healthy diets, which are based primarily on healthy eating habits, without too much restriction, strict counting of calories, and so on, recommend the Indian nuts in their menus. Although it is caloric and requires moderate dosing, its great advantage is that it does not contain cholesterol, and on the other hand it is rich in plant fibers that accelerate metabolism, improve digestion and regulate better digestion. In many forums and portals about weight loss and diet, nuts is mentioned as a saving food, because it gives the diet the necessary feeling of satiety, but also of satisfaction, which is very important for the motivation of every person who fights with against excess weight. It is not necessary, on the other hand, to attribute miraculous and almost magical powers to this nut since it does not lead to anything. In combination with honey and red wine, Indian walnut becomes a powerful aphrodisiac and stimulates sexual drive in both partners. It improves blood flow throughout the body - solves the problem of erectile dysfunction in men and boosts sexual drive. It improves mood, prevents depression and makes negative thoughts disappear from the head. Inspires partners to love each other and relieves us of stress. In many tribes in Latin America, the Indian nuts were used to strengthen the potency, and are still used today. Indian walnuts can be added to almost all dishes, their flavor will improve the taste of every meal. Weather it comes to vegetable salads, porridge or if we eat them as a snack all depends on us. It all depends on our imagination and creativity to choose how we use them in everyday nutrition. Note that Indian walnut is allergenic and caution is advised. Mix well all the ingredients in the blender for 30 seconds. If your mixture is too thick, add more spoon-two of oil and re-activate the blender until you get a homogeneous mixture. Use obtained butter as a spread, sweet or as part of some other dishes. INDIAN WALNUT DURING PREGNANCY - should we use it? It is always not good to give pregnant women any general advice on nutrition. The Indian nut is certainly an allergen and we should pay attention to it. On the other hand, there are scientific research and numerous professional studies that have dealt with this problem. One of them is from Lindsey Fraser, a doctor from Boston, who just proved that mothers who consumed Indian nuts, almonds, hazelnuts, peanuts and pistachio nuts during pregnancy gave birth to children far more resistant to allergies of some kind of nut and other pitted fruits. In this way the doctor concluded that nuts protect against future allergies. Other benefit is that pregnant women had far better nutrition and have adopted healthier eating habits. Of course, her research was not wholeheartedly accepted by the scientific community, and even today there is a lot of contradictions about everything, some suggest that the Indian walnut should not be recommended in nutrition and completely avoided.